A magick sigil is a symbol, logo, seal or some kind of doodle, or it can be purely imagined. Working in mystical current a magick sigil can be created in several ways. It is then 'charged' with energy. The way the energy is created is dependent upon the choice of the creator, there are various ways to create the energy used to charge the sigil. Company logos and symbols can become very powerful over time and can self charge themselves. How often do you see a company logo and get a certain emotion from it? This is often attached to an advertising campaign that works by planting the logo into your sub-conscious mind. The advert creates a certain emotion, then overlays the company logo, so in the future that logo is associated with that emotion. The more of that emotion created by customers when they see that logo, the more energy is sent to that logo. Eventually it becomes more and more powerful. Is this the real reason why long established businesses are more trusted and accepted than new? At times you might be thinking about a certain thing, and as you do you might be making a doodle on a piece of paper. These are sigil also after a fashion, however they remain uncharged unless energy is sent to them. Just the act of writing something down with intent can be enough to set the magick into action. This is why people who make lists often get more things done. Others might see these people as just being more organised and efficient, but the very fact they wrote the list, means they have made a future 'wish' or sigil about what needs to be done. 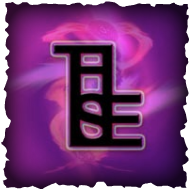 When you are more experienced with sigils you only need to imagine an image of something that represents what you are wanting to happen, then charge it with energy, forget and carry on. Later you will find it happening. Sigils can be made in various ways and are very useful in getting a message to your sub-conscious or Higher Self, without distraction from your conscious mind. It pays to keep a record of all the experiments you try with sigils, as part of the process is sometimes to just forget them and carry on with other things. This gives your Higher Self time to come up with a way to make your wishes come true, and they will.